Growing up in coastal California, the changing of the seasons didn’t play much of a role in my life. Apart from the occasional winter cold snap that would throw the state’s orange harvest into peril, and the infamous summer fog that could turn a sweltering picnic into a bone-chilling nightmare within minutes, things were pretty much constant in a mild, blue-skies kind of way. While there were certainly upsides to weather like this (such as I didn’t own a real winter coat until well into my teens), there were downsides too, and one of those concerned, of all things, food. The problem was, you see, that I grew up with no clue about seasonality, no conception that certain foods only grow naturally at certain times of the year. With year-round sunny skies it seemed perfectly reasonable to expect strawberries on my cereal in February and blueberries on my pancakes in November, and while probably some of what we ate was flown in from other hemispheres, much of it was even – if industrial agribusiness can be called as such – locally grown. The fact that such fruit was tasteless was beside the point; it was there and it looked ripe, so regardless of what the calendar said, we ate it. There was one exception to this, however: summer, and summer only, was watermelon time. My father, the most passionate consumer I have ever known, would wait all year, eyeing the winter melons flown in from Mexico with disdain, until sometime in late June he would start prodding the specimens on display at his local market, thwacking and tapping and sniffing for several weeks until finally he deemed them ready. Then and only then, we would lug one home, a deep-green, sausage-shaped monster weighing nearly as much as I did, clearing off an entire shelf in the fridge to accommodate it. When it had chilled to icy perfection, carving it up had its own special protocol: taking the biggest knife he had, my dad would divide the melon’s stubborn midsection into massive slices, like rounds cut from the trunk of an ancient tree, sometimes so big they would dwarf the dinner plates he put them on. We would use both fork and knife to attack them, as if they were steaks instead of pieces of fruit on our plates, and we would always start from the center of the slice – the crispest, sweetest part – and work our way outwards, spitting the black seeds into the enlarging hole in the middle, until we were left with nothing but a hollow green ring and a stomach almost painfully full. Though the ritual itself was certainly half the fun, in my memory those watermelons were truly something special, so sweet and perfumed they seemed almost hyper-real, and the fact that they were only available for a couple of months each year made each one taste only sweeter. They say that once you’ve eaten something at the peak of its ripeness, nothing else can ever compare. That would seem to explain why finding good watermelon is such an exercise in frustration for me now, but I actually think there’s more to it than that. In fact, I know that a large part of it is down to biology, as those exquisite, oblong watermelons of my youth are becoming an endangered species, replaced by a growing preference for hybrid seedless varieties. ‘Who would want to eat seeds when you can eat seedless?’ seems to be the prevailing mantra, yet I can only assume that the people buying into these new-fangled hybrids have never actually tasted a truly good watermelon. The differences between the two, at least to my tastebuds, are gargantuan; where the seeded melon is complex, floral, and slightly acidic, the seedless melon is watery and cloying with only the barest whisper of that quintessential watermelon flavor. Not to mention that they’re not even really seedless – it’s just that the seeds, being white instead of black, are more difficult to spot before consumption. And lest you think this is some kind of localized problem, it’s not; my dad, who now lives in Oregon, is currently only able to find seeded melons at one lone store in his area, while here in Scotland, the exclusively seedless melons we get by now are not even worthy of their name. Though I could go on all day about the lunacy of breeding out flavor for convenience, it’s not actually all bad. In fact, as a result of so many mediocre melons, I’ve discovered some pretty interesting ways of serving them up that do a good job of masking their flaws. This watermelon-feta salad is one spectacular example, and I’ve recently discovered another that is currently causing some dangerously obsessive behavior chez nous (and not just from me, which is always a good sign!). Though you could easily get away with calling this a drink, a dessert or a snack, I don’t really know which one is most accurate; all I know is that it’s so, so delicious, and so, so easy. You basically just cube up the flesh of a watermelon – something with some flavor is best, and the flesh really shouldn’t be mushy – and you leave it to soak in a sweet and icy bath tinged with rosewater and lime. Although it may not sound like much, the rosewater works some sort of alchemy on the melon, amplifying and rounding out its fragrance, while the lime provides acidity and a hint of spice to this knockout trinity of flavors. 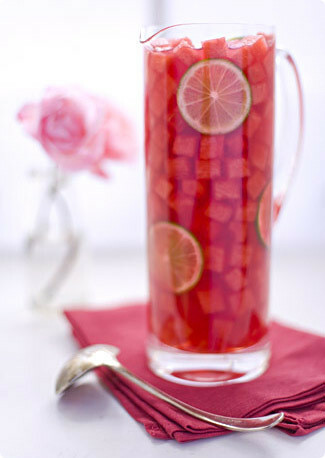 It’s also a two-for-the-price-of-one affair, which is always welcome news; after crunching your way through the sweet, saturated melon cubes, you have the most ambrosial – and refreshing – watermelon-infused nectar waiting to quench any last remnants of thirst. I heartily encourage you to give it a try, but I do want you to promise me one thing. If by any miracle you manage to bring home that perfect melon – you know, the kind that makes you wonder how on earth you ever considered your life complete before tasting it – you won’t do anything with it except get out your biggest knife, slice off a hunk of completely immodest proportions, and find yourself some sunny corner in which to devour it, bite by luscious bite. And then you’ll give me a call – I’ll be on the next plane to join you. I have Indian blogger Richa to thank for inspiring this one – her rhapsodizing, which is what lured me in, is every bit justified. I have naturally made a few of my own adjustments, such as the substitute of lime juice for lemon, and I’ve left out the pinch of black salt, that pungent, sulfurous salt commonly found in Indian snacks and drinks. Though I haven’t yet tried the combination myself – I’m too enamored of it just like this – if you have some on hand, by all means throw in a pinch and see what it adds. Also, I find that preparing a simple syrup is the best way to sweeten this, as you can add more of it to taste at any point without having to worry about undissolved sugar, but if you can’t be bothered to fire up the stove, just throw in some superfine (caster) sugar and you shouldn’t have a problem… that is, apart from the fact that however much of this you make there is never enough! In a medium saucepan combine the sugar and water and heat until the sugar has completely dissolved, stirring occasionally. Remove and let the syrup cool while you prepare the watermelon. Then, in a large bowl, combine the cubed watermelon, lime juice and some of the cooled syrup to taste. Add a splash of rosewater and several handfuls of ice – about a cup per pound of melon is a good estimate, but more or less is fine too depending on how much liquid you want (and if the ice doesn’t create enough liquid you can supplement it before serving with some cold water). Set the bowl in the fridge for about an hour, stirring once or twice, or until the ice cubes have mostly melted. Taste again and adjust the balance of syrup, lime juice and rosewater to your liking, then serve immediately in bowls or wide tumblers, with spoons on the side. The watermelon is best eaten the day it’s made, though 24 hours or so in the fridge won’t do it too much damage. The simple syrup keeps indefinitely at room temperature. Mmmmm yum. I will try this on my husband who is also a watermelon lover. In our household my husband likes to eat the watermelon in a bath of lime juice and chili salt. Melissa,I hate to impugn your ancestry, but your father was a heathen. The only proper way to slice watermelon is nose-to-tail. Here in the south we salt watermelon (cut, properly, in wedges) so it’s no wonder I liked the feta and watermelon so much. Melissa, wow! Gorgeous picture and lovely write up. I am such a fan of rosewater and this recipe finally gives me a reason to buy a watermelon. Like you, I find them mostly disappointing so I have avoided them for too many years.. Man, that picture, with all the pink.. so pretty! Looks delicious! Another watermelon recipe you might try is one I posted on a couple of weeks ago: Watermelon with Lime and Mint. Nothing will ever match the melons I used to get in China, small and sweet. We’d put one in a string bag to take on the train, cutting the top off to scoop out the flesh with a spoon, and spitting the seeds out the window. I am totally with you. All my friends here think I don’t like watermelon, they don’t know I don’t like the ones you get nowadays here in Europe. In my childhood, in Turkey, we had the sweetest ones, and even the seeds were good for more fun: We washed and dried them in the sun, and then we ate them, like sunflower seeds, snapping open with the front teeth, sucking the innards out. Thanks for this post! I also _adore_ watermelons! Your photo is amazing! Very very pretty! Interesting write-up, too. A variation on your idea is the Watermelon G&T. Cube watermelon to the size of a large ice cube and drop a few in a gin and tonic. Both the liquor and the carbonation get into the melon, making it an aromatic and bubbling treat at the end of your drink. The flavor of the melon doesn’t infuse the drink too much — using a more subtle gin brings it farther out.Beautiful picture and prose, by the way. Melissa, I’m glad you enjoyed the watermelon drink!I’m honored to be mentioned in your beautiful website :)The picture is too good for words,as all ur pictures always are! Even the cubes are so uniform, can’t take my eyes off it, I gotta’ go make another batch for myself! This is wonderful, beautiful, and looks positvely refreshing. I love adding a drop of rosewater to fruit salad, so I’m sure this would be even better. This looks absolutely yummy! But better yet, I enjoyed your "narrative" as much as the recipe! Absolutely stunning photo! I have rosewater, but I also have a bottle of rose syrup I brought back from France recently…do you have any suggestions for using that in lieu of the simple syrup? A cup of the rose syrup seems like it would be too strong.Thanks for your lovely blog! Melissa, you brought back some great memory of my Thailand trip with this watermelon drink. Gorgeous, gorgeous, gorgeous!!! I didn’t think I could read every word of a post devoted entirely to the intricacies of the Watermelon, but, I finished and realised I had been sat with a gawking smile, loving every minute of it. Great photo too. Hi Melissa,I found your blog through visiting As Dear As Salt – Richa’s blog and boy am I glad I found this site. Your work’s is exceptional. Now I going to spend the rest of my evening here :)I’ve added you to my blog roll and feeds. Certainly hope that you would consider adding my blog to your listing of blogs from around the world – I am currently located in Barbados. This brought a smile to my face and reminded me of how my grandfather used to serve watermelon to us grandchildren. He would slice large rounds and we would troop outside where at his urging we would eat them from the inside out using only our mouths- no cheating with cutlery or by pulling chunks with our hands. Invariably we would be covered in watermelon, but he would dive in with us, and he always instigated seed spitting contests. Thanks for this wonderful post. I am new blogger.You have a very impressive site. I love your creativity and devotion to the recipes you write. I am adding you on my blog roll. I will be visiting frequently. lovely, lovely picture. I was served a version of watermelon and feta salad at a friend’s house last week and loved it. Such an unusual and tasty combination. We just made this to cool down from the summerheat that has finely arrived and it was delicious. I used a plain round one but can tell you there are lots and lots of oval watermelons in Basel with seeds so perhaps an option for your next summer destiation? I really think one sip would just send me to heaven! I have such clear memories of my father teaching us how to pick a ripe melon, thumping the melon with cocked head, listening for that deep hollow sound. I remember sitting on our back porch with my younger siblings, holding huge slices of the ripest, reddest, seed-packed watermelon; the juices running down my arms and hitting the hot pavement creating a perfume of warm watermelon juice on mineral-rich poured concrete. We were were allowed spit our seeds as far into the yard as we could, it was heaven. I…can’t…express…WOW!!!! Wow. Thank you for making a post so full of sheer "punch" and "pazzaz"! I can’t wait to try this recipe. Wow, I totally get the watermelon thing! In fact, I’m in Trinidad right now and the watermelon looks so fantastic but it is totally devoid of TASTE. So sad and depressing…but your melon rose thingy sounds divine! Yum. Try a splash of basil paste or basil with it. It’s spectacular with watermelon. wow look at that! and the photo is just amazing! Do you recommend basil with the rose syrup in there though? In anycase, I know that when summer comes along I will definately have to try this drink out! Great post! It was in my mind for almost a year before I had a chance to finally start messing with it last week. The lime and rosewater really are great accompaniments for the watermelon. I am also going to try some orange flower water and see what that does. I decided to take this whole idea one step further. I muddled the melon cubes with sugar, strained, then re-muddled the resultant mush with lime juice and rosewater and re-strained. I put the resultant shockingly pink and ultra tasty watermelon syrup into the bottom of highball glasses and topped them up with club soda. Yum.